Roger Louis Kaffer was born in Joliet on August 14, 1927, to Earl Louis Kaffer and Helen Ruth (McManus) Kaffer. He was baptized and confirmed at St. Raymond Parish and received his elementary education at the parish grade school. In 1945 he graduated from Joliet Township High School and then attended Quigley Preparatory Seminary. He studied at St. Mary of the Lake Seminary in Mundelein from which he received a Licentiate in Sacred Theology. Roger Kaffer was ordained to the priesthood on May 1, 1954 at the Cathedral of St. Raymond in Joliet by Bishop Martin D. McNamara. His first assignment was as associate pastor at St. Paul the Apostle Parish in Joliet. He served as a Notary at the Chancery until 1956. From 1956 to 1958, Father Kaffer studied at the Pontifical Gregorian University in Rome where he earned a Licentiate in Canon Law. Providence Catholic High School in New Lenox benefited from Father Kaffer’s educational leadership when he became its principal in 1970. It was his practice to visit every family who had a child enrolled in the school. His dedication to improving the school’s buildings and grounds was evidenced when he was seen driving a back hoe, laying bricks and doing general construction work. To this day, former students speak of his impact on their lives and his pastoral care for them and their families. Father Kaffer served as weekend assistant at St. Bernard Parish in Joliet beginning in 1970 and at St. Joseph Parish in Joliet beginning in 1974. He obtained a Doctorate in Pastoral Ministry in 1984 from St. Mary of the Lake Seminary. In January of 1985, Father Kaffer was appointed temporary administrator of the Cathedral and in February was named rector of the Cathedral. On April 20, 1985, Father Kaffer was named Auxiliary Bishop to Bishop Joseph L. Imesch and Titular Bishop of Dusa in Northern Africa. Bishop Kaffer was ordained to the episcopacy by Bishop Imesch on June 26, 1985 at the Cathedral of St. Raymond in Joliet. He was appointed Vicar General and Vicar for Priests, positions he held until 2002. 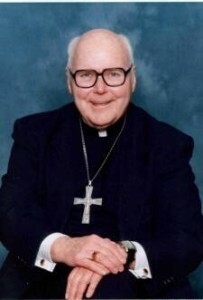 From 1986 to 1989, he served as Chair of the Second Synod of Joliet. In March of 2002, Bishop Kaffer was appointed Secretary for Education. In addition to his diocesan responsibilities, he was honored to be State Chaplain for the Knights of Columbus from 1993 to 2009. Although retired in 2002, Bishop Kaffer lived out his Episcopal motto, Serve and Give, with great vigor. He often said that he wanted to devote his years in retirement to the sanctification of priests. Bishop Kaffer continued to give retreats to priests and bishops, to offer spiritual direction and to assist with Confirmations. He took great delight in the fact that with retirement he was no longer required to attend meetings. Because of his belief that youth were not the future of the Church but the now of the Church, Bishop Kaffer participated in every celebration of World Youth Day, the last being in August of 2008, when with great difficulty he journeyed to Australia to be with the youth he so dearly loved. On September 23, 2008, Bishop Kaffer moved to Our Lady of the Angels Retirement Home in Joliet where in October he suffered a mild heart attack and was diagnosed with prostate cancer. Bishop Kaffer remained at OLA until his death.